It was in the check-out line at Trader Joe's that Greta and I serendipitously realized we were, in fact, somewhat neighbors in our small (nay micro) town. She was the cashier and I, at long last, had the chance to tell her that I greatly admired the landscaping around her old farm house. Had wanted to copy it, in fact. That I'd even stopped to take pictures on my evening walk, but decided against it as I didn't want to seem stalker-ish. Now, five years later, we're still somewhat neighbors, and I still admire her landscaping. And, as neighbors usually go, we've been on a first name basis since that meeting in Trader joe's, but have known little else about each other. So, I was curious to find out if there was more to tell. After agreeing to an interview, Greta and I met at our only local park on a drizzly, humid summer Saturday morning; she with her young baby and me with my coffee. So, Greta, where do you come from and how did you end up here in our little town? Well, I grew up in Rice Lake, Wisconsin, a small town of about eight thousand people in the Northwestern part of the state. Um...it was a great place to grow up, but not a place I'd necessarily love to live and raise my family. I went to college at UW River Falls to study natural resource management with a minor in land use planning neither of which are currently being used. Here in more populated areas, land management is more like people management. For example, I worked at a state park and spent my time checking park stickers; which, wasn't quite my thing. But, before that, during my college years in River Falls, I'd spend my winter breaks working in Wyoming which is where I met my husband. He's from rochester even though we happened to meet out west. What was he doing in Wyoming? He was on vacation snowmobiling. So, how did that come about that you all met in Wyoming? Where was it you were working and what sort of work were you doing in Wyoming? I was a dog sled guide at a resort called Togwotee Mountain Lodge. You were a dog sled guide? That's phenomenal. Yes, I did it over my four winter breaks during college and then one winter break after college. 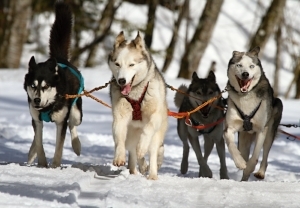 How did you get connected with being a dog sled guide? Again, my brother. He was working at an elk hunting ranch when he got into sled dogs. He got his first dog from the pound, a Siberian Husky, even thought it wasn't really a sled dog, but it worked out. Then we had a collie mix that he transformed into a sled dog, too. The rest we probably got for free. They were mainly retired had hand-me-down dogs. At any given time we'd have between five and nine dogs. How many dogs are usually on a sled? Well, I probably only had like two because I was pretty little - maybe fifth grade. My elementary school was a couple miles from our house so we drove the sled dogs to school for show and tell. Dad and I did fun stuff like that, but the dogs loved it, too. We had Alaskan huskies versus Malamute huskies. Do you miss dog sledding? Yeah, it was certainly fun and it paid for a lot of my college. In Wyoming, I usually gave two tours a day - morning and afternoon. It was fun to meet people from all over and for some it was the first time they'd ever seen snow. It was pretty awesome to see their reactions. Did you ever do any racing? Just a little bit, but it was really just for fun. So, in Wyoming when you first met your husband was it love at first sight? I wouldn't say it was love at first sight but there was a spark, some interest, for sure. It wasn't like my mom who was was fourteen or fifteen and came home from a dance where she met my dad, and said, "I found the man I'm going to marry!" Who called who after you got back to the Midwest, or were you texting? Well, we were still calling, because this was twelve years ago and texts were .20 cents a piece. Though we did have cell phones. I think I probably called him once or twice while I was still in Wyoming and then a couple weeks after I got back to River Falls he was driving through town - he was driving semi - and he called and asked if I wanted him to stop by. I was like, "Sure," and he said, "Well, let's go out for dinner." How long after that before y'all knew this was more serious? Oh, I would say we officially started dating a few weeks after that and then we moved in together a year and a half later. That's when we bought the house here in Racine. It's been ten years since we moved in together. There was definitely small town appeal for both of us. Justin is from this area and knew he didn't want to live in Rochester because a person can't park a semi in front of their house in the city. Even Stewartville was putting some restrictions on parking at that time. So, we needed a nice big driveway that he could park his semi and trailer. Some friends in town walked past our house and saw it was for sale, called us up and we came and looked at it. A week later we owned a house! I was landscaping when we moved and so i had my winters off and i spent that whole first winter learning DIY stuff and doing projects i probably shouldn't have been doing. I mean, really, neither of us had any business doing what we did, but we figured it out. The house needed a lot of work inside and out. Huh. That's why I like your landscaping so much because you actually know what you're doing. Sort of yeah. I landscaped for six years and it sort of made me feel a little bit better about my degree 'cause I did use some water conservation practices and things like that. When did Trader Joe's come into the picture? Trader Joe's opened the sixth year I was landscaping and working a year round job in a climate controlled building became very appealing. Even after just six years my body could already feel it. My back started going out along with the aches and pains. Oh, and coming home physically sick after working on a hot day. Yeah. Indoor work was appealing so I started working at Trader Joe's. What's your favorite Trader Joe's product? Oh, gosh there's so many I could probably choose one from each category. But, oh, if I had to go with just one product that I'd eat for the rest of my life I'd have to say Coffee Bean Blast Ice Cream. Tell me about your grandparent's - on either your mom or your dad's side. Oh, man. So, on my mom's side my grandpa died when I was a baby. He left behind my Grandma, Janet, who was my mom's mom. She was a tough cookie who died two days after her ninetieth birthday. When I was four she remarried a man named Harold and he had a massive heart attack when i was about nine. He was my Grandpa for a very short time and I loved him. He was a super gentle, kind man. I don't have a whole lot of memories of him, but he was the one who got me into gardening. Both he and Grandma Janet loved to garden and gave me my own little garden. After Harold died, my grandma dated another man for about 10 years before he died though they never officially married.. So, she outlived, in essence, 3 husbands. She had five children - four girls and a boy and she lost two of those children and a husband within four years. So, again, she was a tough little cookie and she always said you don't have to look too far to find somebody else who has it worse off than you. Even despite three big losses in four years she just kept on a trukin'. So, Janet was a good woman. To me, she lived her life well, and ninety years is a pretty good run. My grandparents on my dad's side were 100% Swedish so we had a lot of like Swedish traditions and they spoke Swedish. It's like the family...the family traditions from our Swedish heritage I remember most. I guess, yes...yeah, I'm pretty proud to be as Swedish as I am. My son's middle name is my Grandpa's middle name: Hugo. If you could wake up with no responsibilities what would you do with your day? I wouldn't wake up early! Then, I would sit and just enjoy my cup of coffee and then, oh man, I'd probably do crafting stuff. I love to like go on Pinterest and make everything that I see. Or, attempt to make everything. Um...then I'd finish my day...well, I'm totally not a movie's person, but I'd sit down and watch like trash. Like terrible reality Like the Kardashians and other mindless TV. What's your percentage of Pinterest success rate? What's your favorite snack to go with your mindless reality tv? Sunflower seeds in the shell. My son who's in that "no filter" kid talk phase. And, youtube videos of people doing stupid stuff or getting hurt. And, snapchat videos with silly filters. I think that stuff is hilarious which pretty much makes me a six-year-old. Think back to eighth grade...what's the first thing that came to mind. What about high school. What stands out to you the most? Oh, I think of my good friend, Kim, who passed away - too young too soon. What's a memory you have of her? Just how spontaneous she was. Like, if anybody could, or would, do anything It'd be Kim. She'd always be like "let's do it!" and she'd do it. That's the beautiful thing - she lived a short life but i would expect that she had no regrets. There were four of us girls, including Kim, in high school that were together all the time just driving around listening to music. You know at each other's houses just hanging out. What advice do you think Kim would give you today? Whatever you wanna do just do it - don't let anything hold you back. Well...uh, let me see...I seem like an average person - a mom with two kids who works at a grocery store - but I've had some pretty great experiences. In addition to driving dog sleds, I packed elk off the mountain side alone. I've also worked at an assisted living home, a produce farm, Menards, and even Culver's. I've worked a lot of non typical, "tough," and physically demanding jobs and usually to obsession. And, despite the tough work I've had in my life being a mom requires way more hours and hard work than any other job I've had. Plus, I'm the only person I know who prefers Keystone Light to most other beers. And, I'm not afraid to admit it! I may not share Greta's penchant for all things Pinterest (I break out into a sweat at the very idea of going on Pinterest), but I think I have a better understanding of what drew me to an interview with her. She's spunky and hardworking and has had some of those unique life experiences that have shaped her like nothing else could. And, she has a deep and abiding love for family that creates the sort of roots that go deep and give life to everything around. A little fancy, more than a bit unique, and certainly worthy. Thanks, Greta! Don't be surprised if you see me outside your house with a camera. Okay. That sounds stalker-ish. I'll leave the camera at home. Maybe I'll bring a Keystone Light. Well, maybe not. Have you seen the reviews for Keystone Light? Older PostShedding a Red-Light On "The Dumas Hotel"